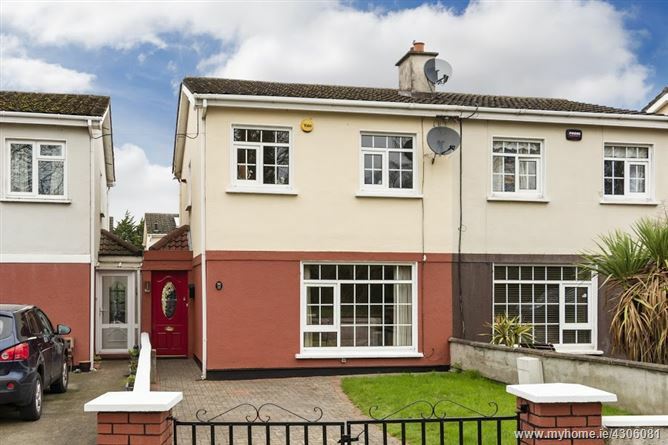 Property Partners Payne MIPAV TRV MCEI have great pleasure in presenting this extended three bed semi with bathroom plus en suite circa 115.15 Sq mtrs found in this established mature neighbourhood in the parish of St. Mary’s Lucan village. Located in a quite cul de sac facing a green area this spacious family home has been well maintained over the years. Accommodation includes storm porch, living room to the front, hallway, kitchen come dining room leading to family room with French doors to patio area. Upstairs three bedrooms master with full en suite consisting of bath, WC, WHB plus family bathroom with corner electric shower. To rear walled garden with block built shed fully wired and plumbed. Found in very good decorative order throughout and offers buyers a quality home in this wonderful location with local parks, a short stroll to well serviced public transport, M50/M4/N4 & M7 all within easy access. Five minutes’ walk to Lucan Village with both Primary & Secondary schools, pubs, shops, Bistro’s & cafés. Hallway: light fitting, laminate wooden floors. Sitting room: 4.46 x 3.87 to front. light fitting, curtains. Kitchen: 4.63 x 3.39. recessed lighting, high quality fitted kitchen, tiled splash back area, stainless steel sink, area fully plumbed, oven, hob, ceramic floor tiles. Master Bedroom: 3.30 x 3.61 to rear. fitted wardrobes, wooden floors. Master en suite: 2.21 x 1.85. bath, heated towel rail, wall tiling, ceramic floor tiling. Bedroom 2: 2.84 x 2.16 to front. wardrobes, wooden floors. Bedroom 3: 3.81 x 2.49. wardrobes, wooden floors. Bathroom: WC, WHB, Triton T90 si electric power shower, mosaic wall tiling.